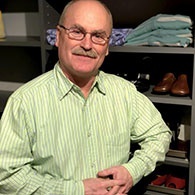 Dan has been with EasyClosets for over 3 years, with decades of prior experience working directly with customers in other creative capacities. He possesses a true understanding of closet design from the ground up. As part of a hands-on learning initiative, he spent time working both directly with the product in the manufacturing facility, as well as a time in the customer service department. His knowledge of all phases of the process from design to installation gives him unique insight from the customer’s perspective. "I wanted to take a moment to send a message to let you know about the exemplary service that Dan has provided over the last couple of weeks. I can tell you that I am beyond pleased to have connected with Dan because he has provided a level of service that I have not experienced in a very long time. I cannot express my gratitude enough for how thorough, attentive, responsive and just down right helpful Dan has been in creating out EasyClosets order." Call or email Dan today to get started on creating the perfect organization solution for any room in your home.